Michael Buffer: Just think if you were walking into a room and there were a group of men that were the MVPs of the last 25 world series. That’s what this is going to be like on September 5 at the Hard Rock. It’s going to be a great night. Michael Moorer: I have been talking to all of these heavyweight champions over the past couple of months and they are all very excited to come in here for this big weekend. They will all be here. Mike Marrone: All these people yelling for you in here – they don’t fight for you Shannon. You fight for you. On the fifth, in the ing, it’s just going to be me and you. None of that matters to me because on September 5 I am coming to win. 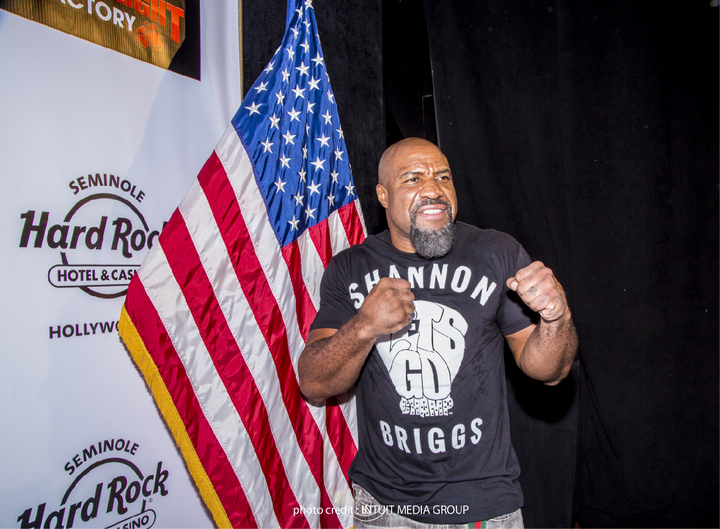 Shannon Briggs: I am so ready for this fight. I could fight right now. I am looking to do big things and this guy Marrone is in my way. You know I want to fight Klitschko but I have to take care of this guy first and I am ready (looking at Marrone). I am the champ. I am the two-time heavyweight champion of the world and I am in phenomenal shape – the best shape of my life (takes shirt off). Look at me. Look at me now! (steps out in front of podium). Marrone: So am I. I am ready to fight right now too (leaning over to the edge of his seat). 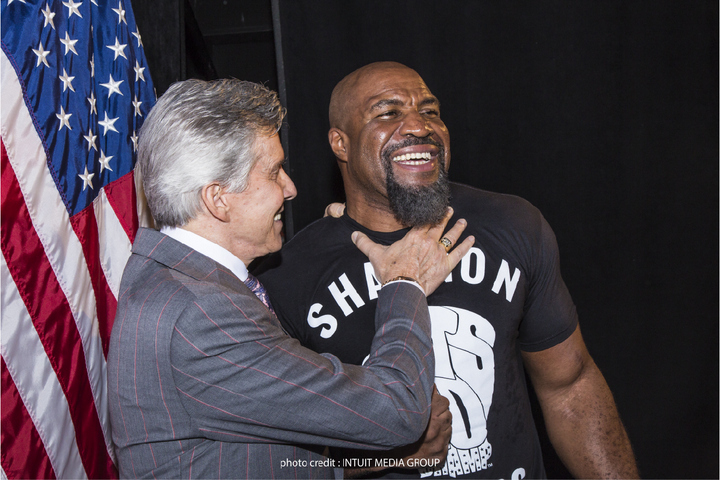 Hollywood, Fla. (Aug. 11, 2015) – On Saturday, Sept. 5, with more than 20 former world heavyweight champions ringside, former Lineal and World Boxing Organization (WBO) world heavyweight champion Shannon “The Cannon” Briggs will battle Mike Marrone in a 12-round heavyweight bout, headlining “World Heavyweight Champions – Saturday Fight Night” at the Seminole Hard Rock Hotel & Casino. The event’s card features eight heavyweight bouts with world-famous ring announcer Michael Buffer calling the main event to the ring. The ringside area will consist of V.I.P. tables of 10, each with a former world heavyweight champion as a guest-host. Tables are being sold as part of a sponsorship package that will include numerous items, including autographs and photos. 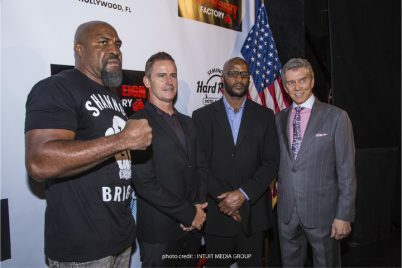 Undisputed world heavyweight champion Evander Holyfield will be ringside, as well as reigning WBA, IBF and WBO champion Wladimir Klitschko. Undisputed world heavyweight champion Mike Tyson will be attending festivities leading up to Saturday Fight Night. 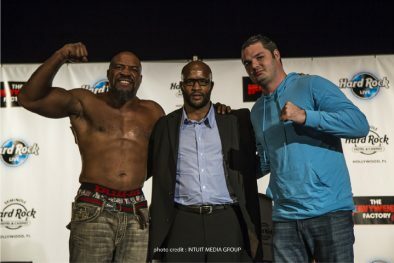 Other former world heavyweight champions confirmed to attend include Lennox Lewis, Roy Jones Jr., Larry Holmes, Michael Moorer, Riddick Bowe, Ray Mercer, Hasim Rahman, Tony Tucker, Tony Tubbs, James “Bonecrusher” Smith, Michael Bentt, Lamon Brewster, Chris Byrd, John Ruiz, Mike Weaver, Tim Witherspoon, Pinklon Thomas, Leon Spinks, Michael Spinks and Bruce Seldon. 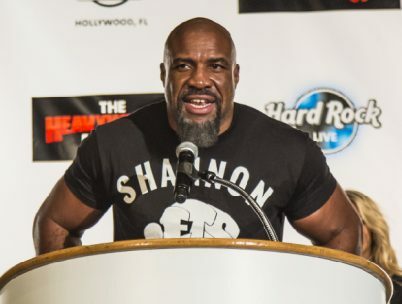 Shannon “The Cannon” Briggs (58-6-1, 51 KOs), from Brooklyn, New York, made his professional debut in 1992 and began his career with 25 consecutive wins. He is the current world-record-holder for 38 first-round knockouts. Briggs defeated George Foreman on Nov. 22, 1997, to become the Lineal Heavyweight Champion and defeated Sergei Liakhovich on Nov. 6, 2005, for the WBO world heavyweight title; he will enter the ring on Sept. 5 to further his quest to defeat a third world heavyweight champion. Mike Marrone (21-4, 15 KOs) from Vero Beach, Florida, made his professional debut in 2004 and won his first 18 bouts, 12 of which were by knockout. 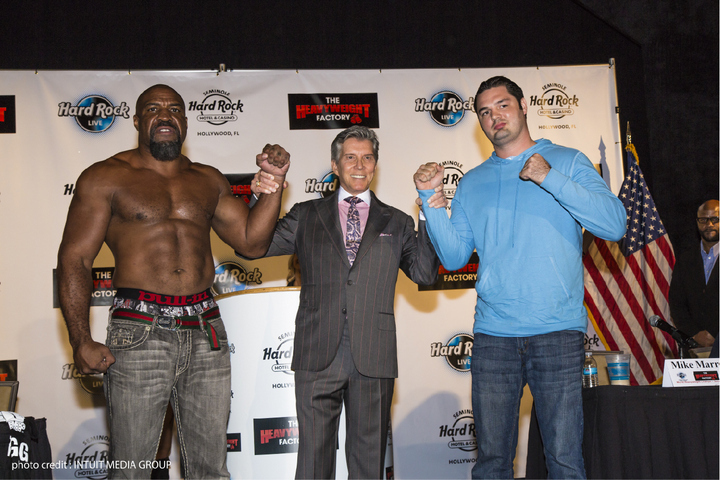 He last fought at the Hard Rock in 2011 and lost a world cruiserweight title fight to Guillermo Jones. Tickets cost $154, $104 and $54. * All seats are reserved and available at all Ticketmaster outlets online at www.myhrl.com, www.ticketmaster.com or charge by phone: 1-800-745-3000. Doors open one hour prior to show start time. *Additional fees may apply.